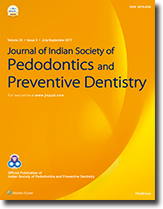 Objectives: The present study was aimed to assess the severity of malocclusion and orthodontic treatment needs among 12–15-year-old schoolchildren in rural area of Namakkal district, Tamil Nadu, India, using the Dental Aesthetic Index (DAI). Materials and Methods: A cross-sectional study was conducted among a sample of 1078 schoolchildren (12–15 years of age) who were selected by two-stage cluster sampling technique. Severity of malocclusion and orthodontic treatment needs were assessed according to the DAI using a specially designed survey pro forma with the aid of the WHO's Oral Health Survey: Basic Methods. Based on the distribution of data, analysis of variance and unpaired student t-test were used. Results: Out of the total of 1078 children examined, 528 (49%) were males and 550 (57%) were females. The results indicate that 82.74% of the schoolchildren were found with little or no malocclusion requiring no orthodontic treatment. The gender-wise distribution of DAI score among children aged 12 years had significant difference between males (20.43 ± 3.67) and females (21.62 ± 4.335) (P = 0.015) and children aged 15 years also showed highly significant difference among gender (P = 0.000). Conclusion: Malocclusion not only impacts the appearance of the person but also affects the self-esteem and psychological well-being. This is the first step in understanding the treatment need so that further steps can be taken in preventive and interceptive care. Aim: The aim of this study is to assess the maternal risk factors and its relationship with early childhood caries (ECC) among preschoolchildren in Mangaluru city. Methods: Children aged 3–5 years attending preschool (Anganwadi) and their mothers were included in the study. A total of 120 child–mother pairs participated in the study. The maternal risk factors were assessed by a pretested questionnaire. After obtaining the consent, the mother and their children were clinically examined for dental caries using the WHO criteria (1997). Results were analyzed using SPSS 18.0. Results: Significant difference was found in mother's caries activity, high level of Streptococcus mutans, brushing frequency, diet of the mother, and their child's caries experience. Conclusion: A relationship between maternal risk factors and ECC is a result of a multifactorial and a comprehensive model that includes psychological and behavioral aspects. Caries prevention strategy should be that every child should receive oral care before age of one so that needful children can be instituted with preventive measures and their parents can be targeted for educational programs. Introduction: Dental fluorosis is considered as a serious public health problem in India. Water is usually the major source of fluoride exposure, but this is not the case always as exposure to local factors like diet can be important in some situations. Earlier studies have shown that jowar (a millet) consumption interacts with fluoride in the body and elevate fluorosis. Aim and Objective: To determine the association between jowar consumption and severity of dental fluorosis. Materials and Methods: Hundred schoolgoing children of 10–14 years old was selected by random sampling from Wadloor village. Dental fluorosis was measured in children by Thylstrup–Fejerskov index (1988). Twenty-four hours diet recall method was used to know the exposure to jowar of the children. A pretested questionnaire was given to mother or caretaker to record the jowar consumption. Spot urine samples of children were collected in plastic containers (20 ml) and brought to the laboratory in icebox. Ion selective electrode method was used to measure the fluoride level in urine samples of children. Results: On comparison of the quantity of jowar and fluorosis using Pearson Chi-square test, difference among variable was found out to be statistically significant (P = 0.013, P < 0.05). On comparison of quantity jowar consumption and urinary fluoride level using Pearson Chi-square test, the difference among variable was found statistically significant (P < 0.001). Conclusion: Jowar consuming population was positively associated with severity of dental fluorosis. Introduction: Over 5% of the world's population has disabling hearing loss. The oral health of the disabled may be disused for the reason of the disabling condition, a challenging disease or the limited access to oral health care. Objectives: The objectives of the study were to assess the prevalence of dental caries and periodontal status of institutionalized hearing impaired (HI) children in Khordha district of Odisha. Materials and Methods: A descriptive cross-sectional study on the HI children was conducted in Khordha district, Odisha. Type III examination procedure was conducted to assess the oral health status of the children. Statistical analysis was performed by Chi-square test and Student's t-test, and the significance level was fixed at P < 0.05. Results: The final population consisted of 540 HI children out of which 262 (48.5%) were male and 278 (51.5%) were female, 285 (52.8%) children had severe hearing loss and 227 (42.0%) had profound hearing loss. Bleeding on probing was found in 72 (13.3%) female children as compared to 57 (10.6%) male children. While 131 (24.3%) female children had calculus, 124 (23.0%) male children had the same condition. Total caries prevalence was 19.3%. Statistically highly significant difference was found for mean decayed teeth (DT), missing teeth decayed, missing filled teeth (FT) (P < 0.001), while for mean FT there was no statistically significant difference according to age groups. Statistically highly significant difference was found for mean DT, extracted teeth and decayed, extracted, filled teeth (P < 0.001). Conclusion: An improved accessibility to dental services as well as dental health education is necessary to ensure the optimum dental health within the reach of these less fortunate children. Background: Studies on dental trauma of the normal population have been carried out in the past; however, limited data are available on dental trauma of the handicapped population, especially visually impaired children in Chhattisgarh, India. Aim: The aim of this study is to determine the prevalence of traumatic dental injuries (TDIs) in visually impaired children in relation to age, cause, and place of injury. Materials and Methods: Epidemiological study was carried out among 400 children from various special schools of visually impaired children of Chhattisgarh followed by school dental checkup camps. All the children completed a questionnaire related history of trauma, cause, and place. The prevalence of TDIs in each special child was recorded based on the Epidemiological classification of TDIs by the WHO and was modified by Andreasen et al. (2007). Statistical Analysis: Statistical analysis was done using SPSS version 17. The level of significance was fixed at P ≤ 0.05. Association between categorical variables was done using Chi-square test. Results: The results showed that out of 400 children, 39% suffered from TDIs. Permanent maxillary central incisors were most commonly injured teeth with injuries involving enamel (53%) being most frequently observed. Increased overjet and inadequate lip coverage were significantly associated with the occurrence of trauma. Conclusion: As blind children are at the risk of multiple TDI, it is necessary to create awareness, health education, and periodic screening for appropriate management. Introduction: Special children are among the underserved dental patient groups around the globe. Oral health care for disabled children remain an unmet challenge. One out of two persons with a significant disability cannot find a professional resource to provide appropriate dental care. Identification of barriers can be the first step in addressing the deficiencies in dental care for such patients. Aim: To investigate the perception of dental practitioners in Kerala, India regarding the hurdles faced by them in providing dental care to Special Needs Children including the challenges faced by them. Materials and Method: 149 dental professionals were interviewed through a questionnaire for their perceived barriers to provide oral health care for children with special needs. Statistical analysis: The data was obtained and Chi-square test, Pearson correlation coefficient and logistic regression model were assessed using the SPSS version 20.0. All analyses were performed using a level of 0.05 for statistical significance. 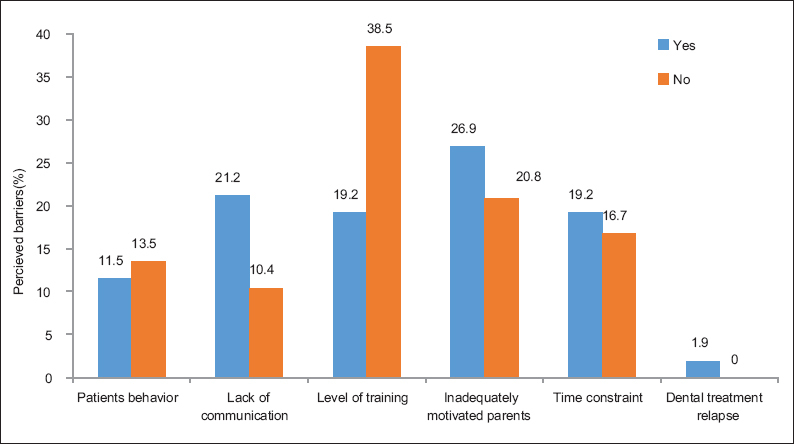 Results: Greatest barriers as perceived by the practitioners were their level of training and lack of motivation of caretakers. Significant association was found between experience of the dentist with the frequency with which they reported seeing children with special needs (p<0.05). Conclusion: Findings from this study provide a valid picture of barriers to access for children with special needs within general dental private practice system. Recommendations for amendment of undergraduate dental curriculum is made in order to equip future graduates to deal with this group of children better. Background: Tooth extractions are associated with anxiety-related situations that can cause behavioral problems in pediatric dental clinics. Aim: We aimed to describe the behavior of children during tooth extraction appointments, compare it to their behavior in preceding and subsequent dental appointments, and assess the behavioral differences according to gender, age, type of dentition, and reason for extraction. Settings and Design: This was a retrospective study based on information obtained from records of children between 6 and 13 years of age who were cared for at the Dentistry School in Pelotas, Brazil. Materials and Methods: Child behavior was assessed during the dental appointment that preceded the tooth extraction, during the tooth extraction appointment, and in the subsequent dental appointment using the Venham Behavior Rating Scale. Statistical Analysis: Results were analyzed using the Pearson Chi-square and McNemar tests. Results: Eighty-nine children were included. Cooperative behavior prevailed in all the dental appointments. The prevalence of “mild/intense protest” was higher in the tooth extraction appointments than in the previous or subsequent dental appointments (P < 0.001). No significant differences in behavior were detected between the type of dentition (primary or permanent teeth), reason for extraction or gender. Conclusion: In this sample of children treated at a dental school, the occurrence of uncooperative behavior was higher during the tooth extraction appointments than in the preceding and subsequent dental appointments. Background: The focus in caries management has shifted to early detection of caries lesions and targeted noninvasive management of incipient lesions using novel remineralizing agents. Aim: This study aimed to compare and evaluate the remineralization potential of commercially available agents containing nano-hydroxyapatite (nano-HA), casein phosphopeptide-amorphous calcium phosphate fluoride (CPP-ACPF), and Tricalcium phosphate (TCP) on artificially induced white spot lesions in primary teeth. Settings and Design: This is an in vitro double-blind randomized study. Materials and Methods: Forty extracted or exfoliated primary teeth were selected and randomized as follows: Group I: FTCP, Group II: fluoridated dentifrice, Group III: CPP-ACPF, and Group IV: Nano-HA. DIAGNOdent readings and scanning electron microscope (SEM) energy dispersive X-ray (EDX) analysis were carried out at baseline. The samples were subjected to the test agents after inducing white spot lesions. The readings were repeated postdemineralization and postremineralization. Statistical Analysis: The data were analyzed using IBM SPSS version 20 software with one-way ANOVA, post hoc Tukey's HSD, and paired t-test. Results: SEM evaluation showed favorable surface changes in all the four study groups after remineralization therapy. Intragroup comparison of DIAGNOdent and EDX readings showed a highly significant difference between baseline, postdemineralization, and postremineralization values. However, the intergroup comparison was statistically nonsignificant. Conclusion: All test agents were comparable in their remineralization potential. Aim: The aim of the study was to assess the microleakage of one high-viscosity conventional glass ionomer cement (GIC) and a bulk-fill composite resin, in comparison to a resin-modified GIC in Class II restorations in primary molars. Materials and Method: Standardized Class II slot cavity preparations were prepared in exfoliating primary molars. Teeth were restored using one of the three materials tested (n = 10): SonicFill bulk-fill composite resin (SF), EQUIA Fil conventional reinforced GIC (EQF), and Vitremer resin-reinforced GIC (VT). The restorations were then subjected to thermocycling procedure (×2000 5°C–55°C 10 s/min) and soaked in 1% neutralized fuchsin solution (pH: 7.4) for 24 h at 37°C. 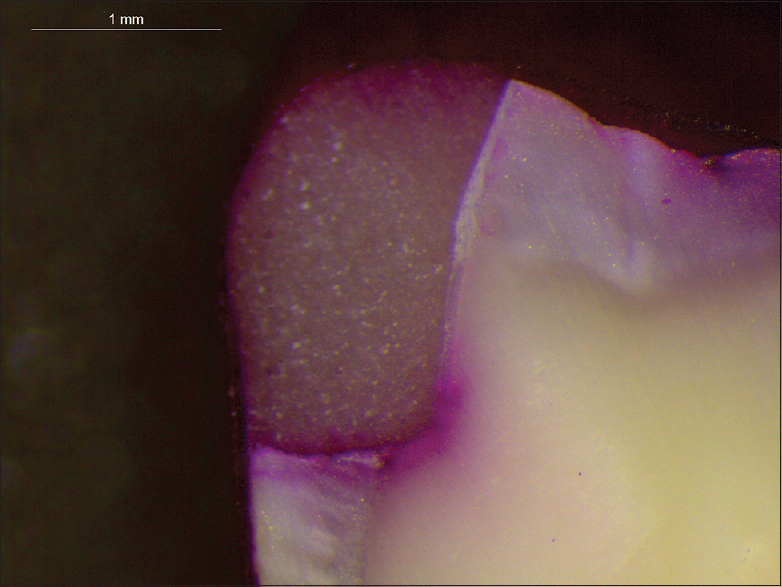 Teeth were sectioned longitudinally in a mesiodistal direction under continuous cooling into three slabs of 1 mm thickness and studied under a stereomicroscope for dye penetration. Statistical Analysis: Data were evaluated by one-way analysis of variance and the Tukey's multiple comparison test employing 95% (α = 0.05). Results: EQF and SF showed significantly lower microleakage scores and percentage of dye penetration (%RL) when compared to VT resin-reinforced GIC (P < 0.001). Conclusion: SF and EQF produced the minimum microleakage when compared to VT in Class II restorations on primary molars. Fewer application procedures and reduction in treatment time in SF and EQF systems proved advantageous in pediatric dentistry. 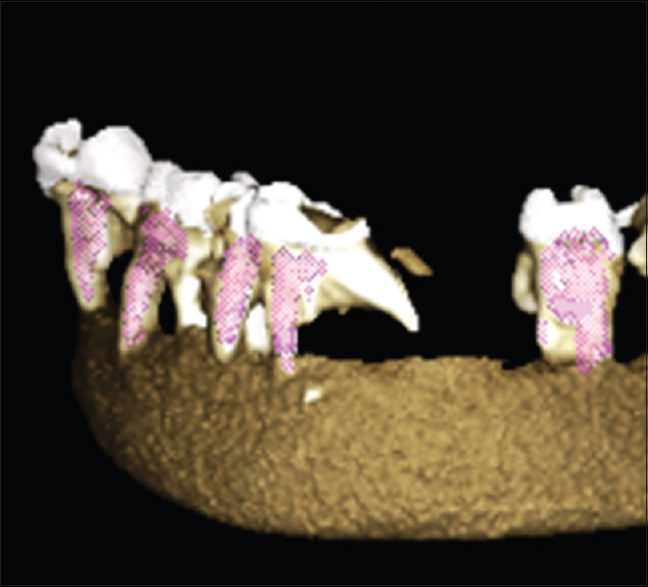 Aim: The aim of this study was to compare and evaluate the efficiency of five different obturation methods in delivering the filling material into the canals of primary teeth using cone beam computerized tomography (CBCT) scan. 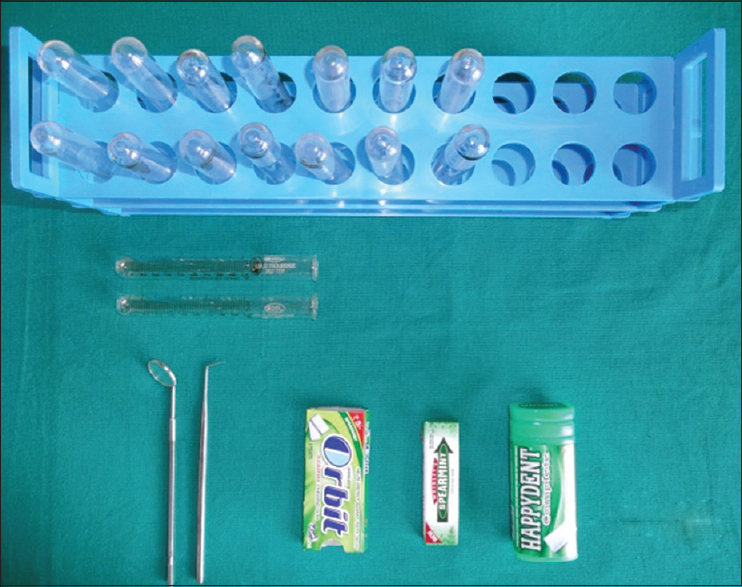 Method: A total of fifty prepared canals of primary teeth which further divided into five groups with ten canals in each group were obturated with zinc oxide-eugenol cement using five different obturation methods such as endodontic plugger, lentulo spiral (handheld), lentulo spiral mounted on slow speed handpiece, local anesthetic syringe, and tuberculin syringe. Using CBCT scan, the pre- and post-obturation volume and the percentage of obturated volume (POV) were calculated for each group. The results obtained were statistically analyzed using one-way analysis of variance and Tukey's post hoc test. Results: Following CBCT scan, the method obturated with lentulo spiral mounted to handpiece showed the highest POV value followed by the method of lentulo spiral mounted to handpiece, hand plugger, and tuberculin syringe. Local anesthetic syringe gave the least POV (P < 0.05). Conclusion: Lentulo spiral mounted to handpiece showed the best technique of obturation using CBCT evaluation among the five groups evaluated in primary teeth. However, more studies are highly essential to prove it a boon for estimating obturation quality in primary teeth. Context: The prominent striae of retzius corresponding to the occurrence of live birth is known as the neonatal line (NNL). The very presence of this line indicates the exposure of the infant to the stressful event of birth. Aims: The study was aimed at locating the NNL in the developing primary teeth of the neonate and associating the presence of NNL to the occurrence of live birth. Materials and Methods: The donated bodies of the neonates were taken, and a surgical incision was made along the crest of the alveolar ridge in the maxillary anterior region, enabling the careful removal of the tooth germs from within the jaw segment. 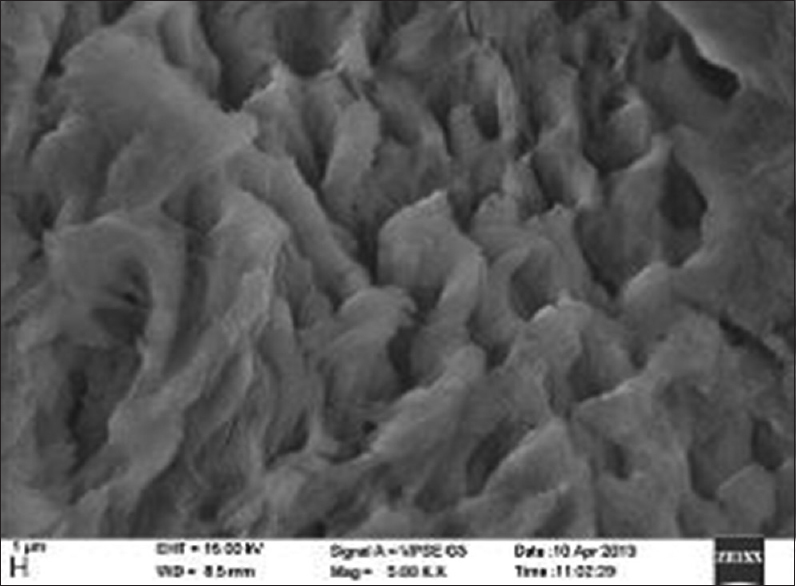 The maxillary central incisor tooth germs were embedded in acrylic and viewed under the stereomicroscope, polarized microscope, and scanning electron microscope (SEM). Statistical Analysis: This being a pilot observational study, no statistical analysis methods were employed. Results: The NNL was best visualized under polarized microscopy and was clearly appreciated in the control samples and faintly seen in the 10-day-old neonate. No evidence of the line was present in the tooth germ of the stillborn child. Conclusion: The very presence of the NNL indicates that the infant was alive during the stressful process of birth. This can be used as substantial evidence in infanticide cases brought before the law. Background and Aim: Adequate salivary flow is an important requisite in the maintenance of oral health. Salivary flow increases in response to both gustatory (taste) and mechanical (chewing) stimuli. Hence, the aim of the present study was to know the efficacy of commercially available chewing gums (sugar free and sugared) on salivary flow rate (SFR) and pH in caries-active and caries-free children. Materials and Methods: One hundred school children aged between 10 and 12 years were divided into two groups on the basis of their caries status into caries free and caries active. Unstimulated saliva was collected before start of the study. Both groups were subjected to three commercially available chewing gums (2 sugar free, 1 sugared) on consecutive days, and saliva was collected at intervals of 2 min (T2), 10 min (T10), and 30 min (T30). The pH and flow rate of saliva samples were measured before and specified time intervals after gum chewing. Results: In both the groups, gum chewing increased the SFR, significantly at T2, and gradually declined at T30 which was significantly higher than baseline values. The pH raised significantly at T2 and gradually declined at T30 which was significantly higher than baseline values with sugar-free gums, but with sugared gums, the pH raised slightly at T2 and dropped significantly at T30. However, no statistically significant differences in pH and flow rate were noticed in both the groups. Conclusion: Chewing of sugar-free gums in both caries-active and caries-free children may aid in reducing the incidence of dental caries. Context: Dental fluorosis is caused by successive exposure to high concentrations of fluoride during tooth development leading to enamel with lower mineral content and increased porosity. Aims: The aim of the study was to evaluate and compare the effectiveness of minimally invasive techniques for the removal of dental fluorosis stains in children in vivo. Design: Ninety children in the age group of 10–17 years were selected. Materials and Methods: The study sample was equally and randomly divided into three groups; Group 1: In-office bleaching with 35% hydrogen peroxide (HP) activated by light-emitting diode (LED) bleaching unit (35% HP), Group 2: Enamel microabrasion (EM) followed by in-office bleaching with 44% carbamide peroxide gel (EM), Group 3: In-office bleaching with 5% sodium hypochlorite (5% NaOCl). Statistical analysis was done using one-way ANOVA test. 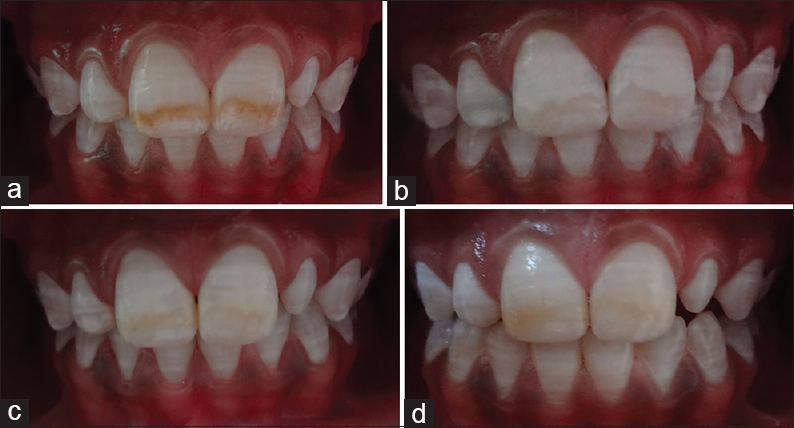 Results: Bleaching with 35% HP activated by LED bleaching unit and EM followed by bleaching with 44% carbamide peroxide were equally effective for the removal of dental fluorosis stains in children in vivo. However, bleaching with 5% NaOCl could not completely remove moderate to severe stains. It was effective in removing only mild stains. Bleaching and microabrasion procedures caused slight decrease in tooth sensitivity readings by electric pulp vitality tester which continued to increase over time. However, none of the patients reported sensitivity in their teeth at any point of time. Patients were highly satisfied with the treatment outcome postoperatively but reported slight relapse of color in the three groups. Conclusions: Bleaching and microabrasion techniques can consider as an interesting alternatives to conventional operative treatment options. Dentigerous cyst or follicular cyst is a type of odontogenic cyst which encloses the crown of an unerupted tooth and is attached to the amelocemental junction and is the second most common odontogenic cyst contributing about 16.6% to 21.3% of all odontogenic cysts. Occurrence of Dentigerous cysts according to Shear is usually in 3rd and 4th decade in contrast to this finding Shibata et al showed that the age of discovery of the dentigerous cyst was generally 9–11 years. The treatment indicated for dentigerous cysts are surgical enucleation of the cyst, along with removal of the involved tooth; or the use of a marsupialization technique, which removes the cyst while preserving the developing tooth. 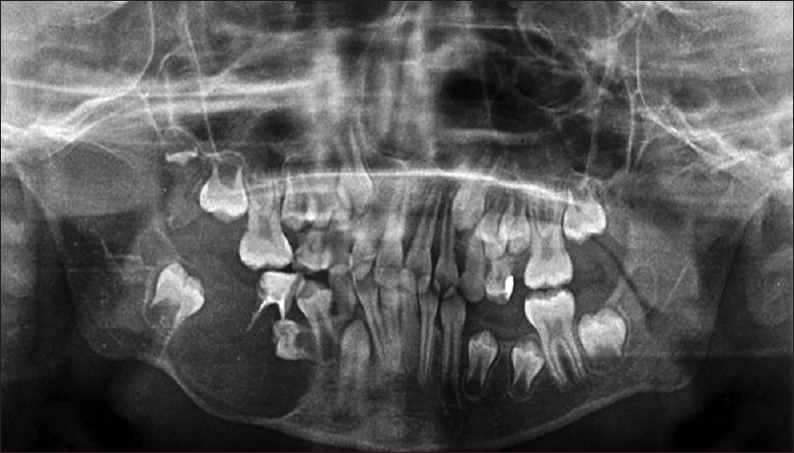 The present case report describes the management of dentigerous cysts in children with the use of Bismuth Subnitrate Iodoform Paste. 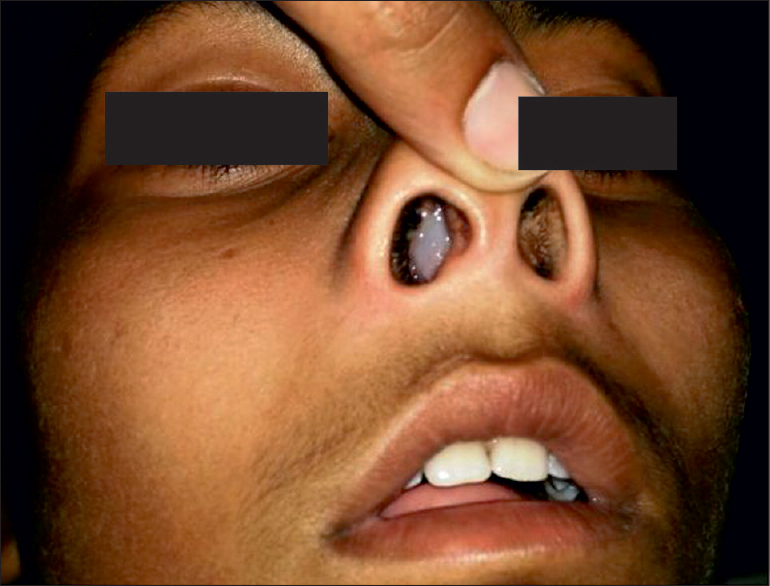 Antrochoanal polyps (ACPs) are benign lesions that arise from the mucosa of the maxillary antrum, grow into the maxillary sinus, and reach the choana with nasal obstruction being their main symptom. Most of these lesions are small and clinically silent and found as incidental finding, but large cysts which occupy the entire antrum have also been reported in literature. Nasal endoscopy and computer tomography (CT) are the golden standard in the diagnosis of ACPs, and enucleation by Caldwell–Luc approach is the recommended treatment for larger antral cysts. This article is a report of a 9-year-old male patient diagnosed with ACP arising from a benign cyst of maxillary antrum with characteristic clinical, CT, and histopathological features along with brief review of literature. Nutrition is important in every stage of child development. A child born with cleft lip and palate may experience difficulties while feeding due to the lack of seal of the oral cavity due to incomplete facial and palatal structures. Difficulty in feeding leads to inadequate nutrition and affects the health. Children with cleft lip and palate need certain modifications to thrive and grow. Feeding difficulties should be assessed and intervened as early as possible, as they are an important aspect of multidisciplinary team approach in management and may have an impact on long-term outcome. This case report presents fabrication of feeding appliance in 6-month-old infant with cleft palate with ethylene vinyl acetate.